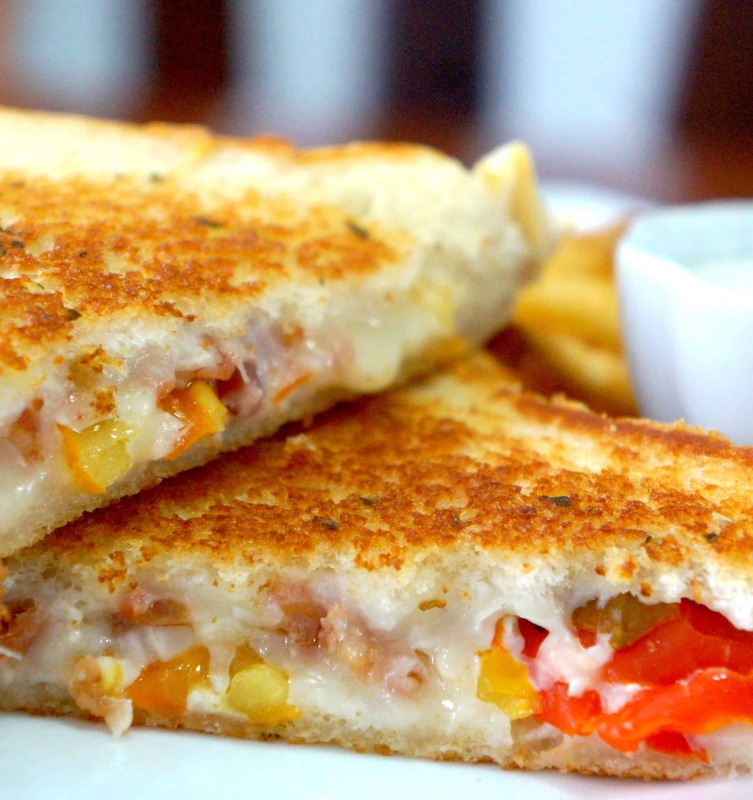 This Bacon and Banana Peppers Grilled Cheese is a tasty, easy lunch recipe. In just ten minutes from start to finish you can make these delicious sandwiches oozing with cheese and a kick of heat. I love grilled cheese sandwiches because they are so easy to make and there are so many possible ingredient combinations to experiment with. You can use all different kinds of cheese and other ingredients and have an entirely different sandwich every time. If you’re looking for a way to spice up your grilled cheese this is the perfect recipe for you. 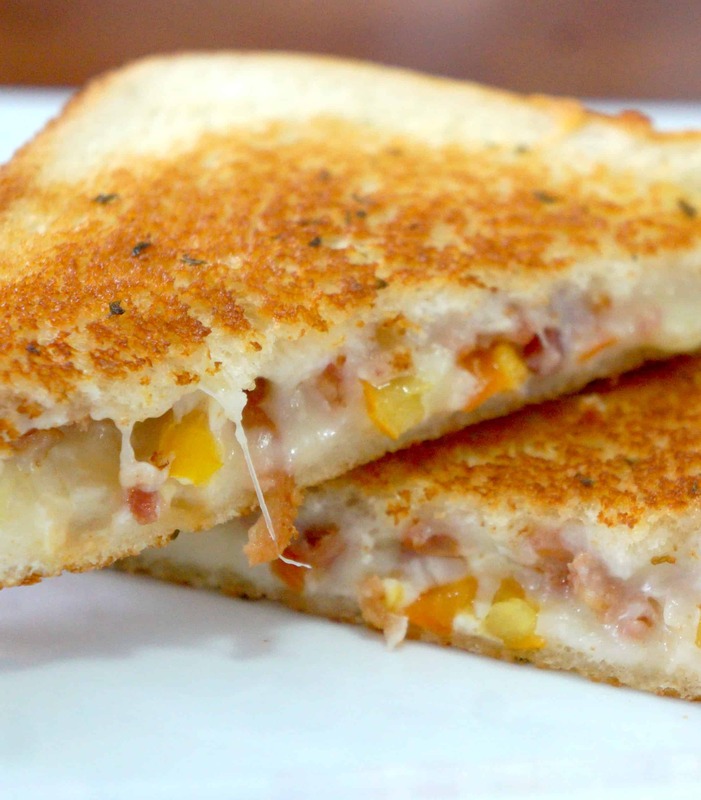 Gooey melted cheese mixed with bacon and hot peppers come together perfectly in this sandwich. First I spread garlic butter one side of every piece of bread. Regular butter or margarine would work as well but the garlic butter adds great flavour. Then I placed two of the slices of bread butter side down in a frying pan and sprinkled them with grated mozzarella cheese. I added real bacon bits because everything is better with bacon, and banana peppers to give the sandwich a kick. To finish off the sandwiches I sprinkled more mozzarella cheese and topped them with the remaining slices of bread buttered side up. I cooked the sandwiches until they were golden brown on the bottom and then flipped them to cook the other side. Like any grilled cheese sandwich you’ll want to serve them right away while the cheese is melted. Next time you are looking for a quick lunch recipe try out these Bacon and Banana Peppers Grilled Cheese Sandwiches. This recipe produces two sandwiches but can very easily be doubled or even tripled to more. If you are looking for more sandwich ideas check out Waffled Grilled Cheese, Everything Bagel Grilled Cheese and Sweet Chili BBQ Chicken Sliders. 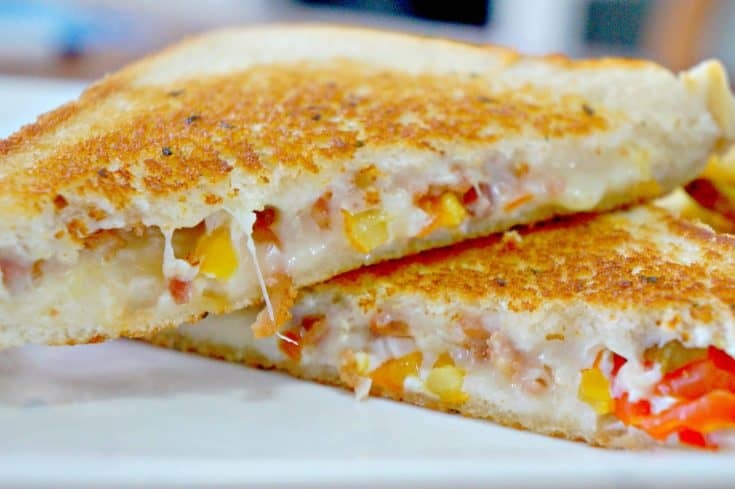 Tasty grilled cheese with bacon bits and hot peppers. Preheat large frying pan on medium heat. Spread garlic margarine on one side of each piece of bread. Place two slices of bread butter side down in frying pan. Sprinkle half of the cheese evenly over the two slices of bread. Sprinkle both the bacon bits and pepper rings over the cheese. Top with remaining cheese and slices of bread butter side up. When the bottom slices of bread are nicely browned flip the sandwiches to brown the remaining side.